It seems like yesterday Daisy was gracing our dining table as a beautiful centerpiece in her bouncer. Our little nugget is all grown up and now in kindergarten. Our home is buzzing with excitement. She’s got new friends, new activities and homework. Shawn loves walking her to school in the mornings and seeing her off for the day. 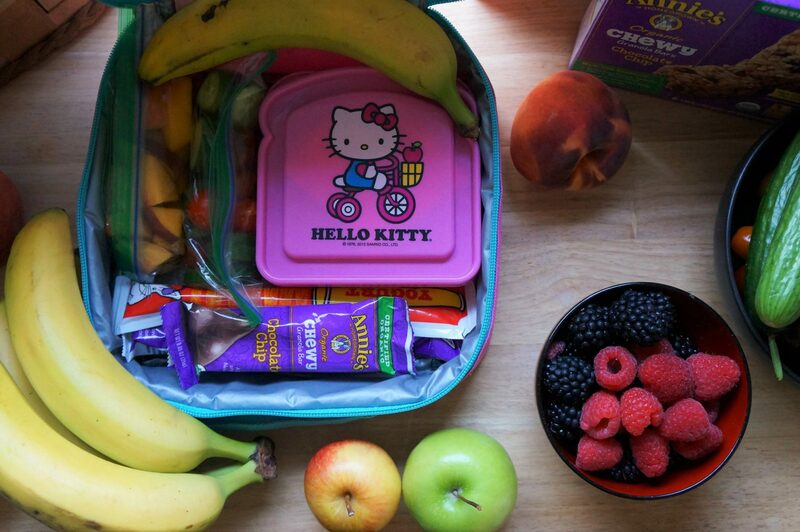 I sneak little heart-shaped notes into her lunchbox to encourage her to read, but packing a healthy meal can be difficult. It’s easy to reach for cereal bars, popcorn and cookies. Annie’s Homegrown offers an impressive variety of products that are certified organic for everybunny, even people who have vegan and grain-free diets. There are so many healthy and delicious things to offer my little sweetheart. Daisy lunch always has a big variety of yummy things. She always gets a sandwich made with fresh bread. We make sure it does not contain any corn syrup and get some of her favorites, either whole wheat sandwich slices, pita, lavash or sesame-studded barbari. She loves ham, smoked turkey, but sometimes we let her have salami. We encourage her to go meatless every now and then with our take on an English classic made of cream cheese and cucumber slices. We know we are doing a good job with the menu when that lunch box comes back empty. Good fortune brought bees to our home when they somehow found a teeny hole and built a hive in our wall. They must have known how much we care for them. These hardworking little creatures are the foundation of our beautiful natural environment, but their population is decreasing at an alarming rate. Pesticides play a big role in their decline. That is why our family supports local organic farmers and any business that sources sustainable, organic, fair-trade goods. Annie’s Homegrown is founded on this principle. I can pronounce every item on their ingredients lists and that gives me peace of mind when offering their products to my family. The company logo features Bernie, Annie’s handsome pet Dutch rabbit who casts his seal of approval on an impressive line of nutritious, budget-friendly prepared foods. Annie’s offers a wide range of items that are both readily available and affordable, so everyone can benefit from eating well. They even have a line of products for people who have special diets including vegan and gluten-free foods. We are big fans of the certified organic Summer Strawberry and Berry Patch Yogurt Tubes. Daisy also loves Annie’s Chewy Chocolate Chip Granola Bars. Daisy’s kindergarten teacher runs a tight ship and a schedule packed with lessons and activities. Eating a good breakfast gets her off to a good start in the morning, but having a good snack and wholesome lunch helps her maintain her stamina through her rigorous day. Though she may not realize it, packing Daisy’s lunchbox every day is really an extension of our love for her. To be sure there is no doubt in her mind, we sneak a little note along with all the yummy goods. She’s just learning to read, so this encourages her to find out what the message says. It also reminds her how much we love and care for her. It’s the little things that mean the most. Annie’s makes quality and affordable organic foods, so everyone can enjoy wholesome living. This makes it easy to introduce healthy habits to our kids that we hope will carry on well into their adult lives. We hope that you try Annie’s Homegrown goodies and enjoy them as much as our family does.